After Mr. Prevention requested an overhaul to “my” Thanksgiving meal in the way of the inclusion of a turkey and mashed potatoes, I was a bit ticked. The audacity of a man to be so…needy! As it would end up, our favorite dish at our meal was this salad. Both of us…loved it. This is not only shocking because the other items gracing our table included a Cornbread, Chorizo, and Jalapeno Stuffing, Whiskey-Glazed Carrots, buttermilk whipped mashed potatoes, and pumpkin pie fudge. We laughed a bit, because that was far from expected. I mean, obviously the salad sounded great — I picked it to serve at our mini Thanksgiving, but the favorite? Now that says something. I truly can’t wait to make this salad again. I will probably add some butternut squash and chicken and make it a meal! In a large bowl, combine the onions, carrots and parsnips. Add the oil, herbes de Provence, salt and pepper; toss to coat evenly. 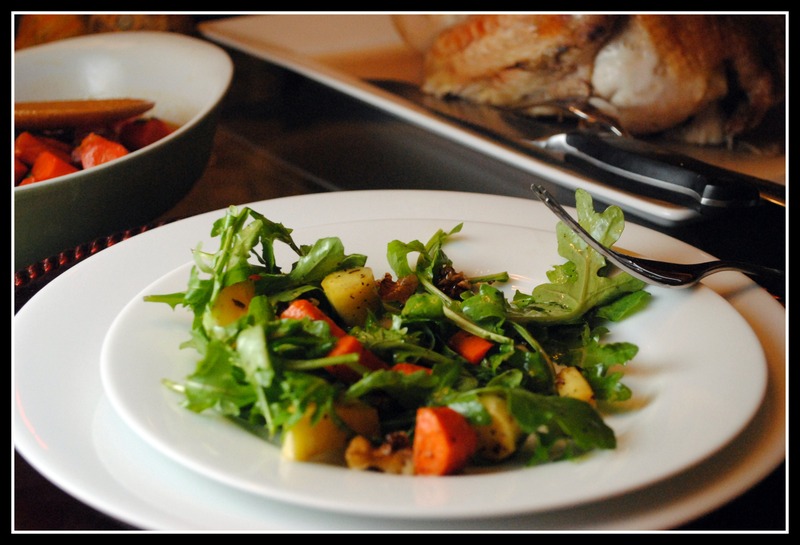 Scatter the vegetables on a large nonstick rimmed baking sheet and roast for 10-15 minutes. Turn the vegetables over and roast until tender and beginning to brown, 10 to 15 minutes longer. Set the vegetables aside. 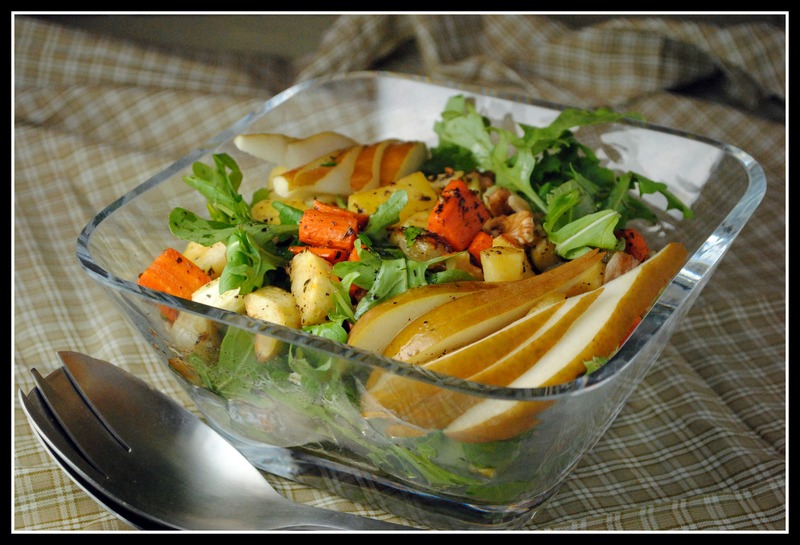 In a salad bowl, combine the arugula, pear slices and roasted vegetables. Add the Apple Cider Vinaigrette and toss until coated. 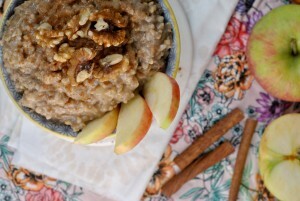 Sprinkle with the chopped walnuts and serve. In a medium bowl, whisk the vinegar, honey, salt and pepper until blended. Gradually whisk in the oil. Yield: 8 servings. Result: Absolutely delicious. Simple, packed with healthy fats and fiber, and quintessential fall in salad form! Enjoy! If you need a last-minute salad option for your Thanksgiving meal, or healthy option for after the main event, you came to the right place today. Stop by tomorrow for the Thanksgiving recipe main event! This salad is beautiful and festive! It would make a lovely addition to Thanksgiving dinner…or a healthy meal anytime! Wishing you and your family a very Happy Thanksgiving, my friend! What a gorgeous salad!! Perfect for turkey day! I am making the same stuffing from cooking light!! And this is now on my menu too!!! I really need to get some herbes de Provence – this looks delicious! It’s always sort of funny when a salad is good enough to truly blow you away. I mean… it’s salad! Have a great holiday, my dear!!! I love when a salad is the best part of a meal. 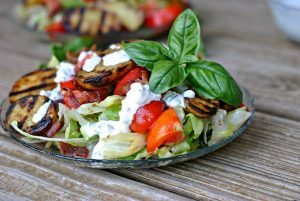 Salads don’t get enough credit, when they’re done right they can be amazing. YUM! 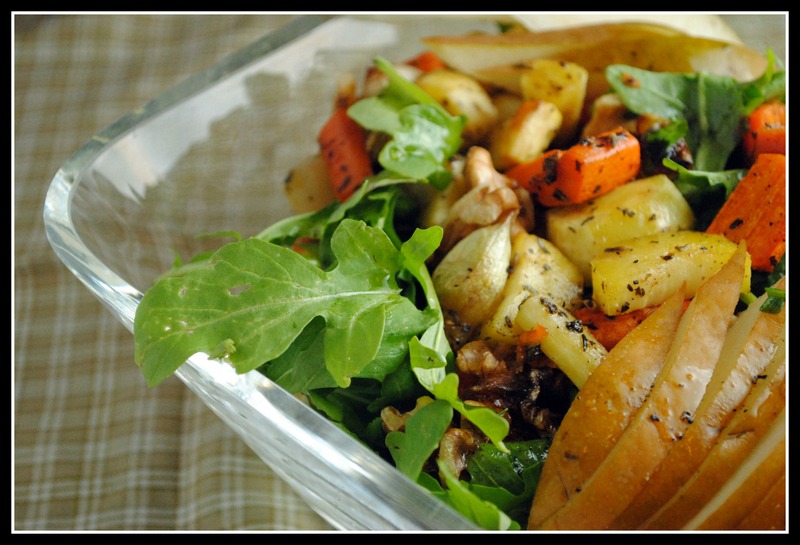 I’ve been craving root vegetables lately, and this sounds like a perfect recipe for me!! I love when the healthy dishes are the ones that people love the most. Good job Mr. P!!! This is a beautiful salad. I absolutely adore root veggies so I’m happy to see them presented this way. 🙂 Nicely done. That salad sounds delicious! I don’t know if I could picture my husband saying a salad was his favorite thing at thanksgiving.. Challenge accepted! Happy Thanksgiving love! I would totally NOT be able to stop at a salad-sized portion with this around. But I don’t have to because it’s so super crazy healthy! I’ll be eating this for lunch next week…I can feel it. Sounds FANTASTIC!! I love roasted root veggies, of any kind. I went to Kroger yesterday to get parsnips for my stuffing and they DIDN’T have any! I was speechless. Have a great Thanksgiving Nicole!